A group of South Korean scientists has developed an artificial skin with sensitivity, the science ministry said Tuesday, a development that could be a boon to a variety of robots and products in numerous fields. 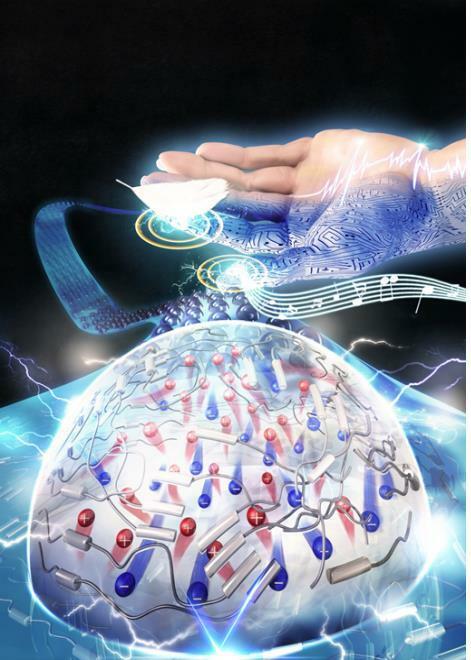 The team lead by Kim Do-hwan at Soongsil University and Jung Hee-tae at Korea Advanced Institute of Science and Technology co-developed the stretchable yet ultrasensitive artificial skin, the Ministry of Science, ICT and Future Planning said. It said scientists developed the artificial skin by examining the skin of mammals. The skin was inspired by the so-called "Piezo2" protein that is found inside of Merkel cells on the top layer of the skin of animals, the ministry said. Scientists copied the physiological tactile sensing mechanism of the protein. "This capability enables voice identification, health monitoring, daily pressure measurements, and even measurements of a heavy weight beyond the capabilities of human skin," the researchers said in a paper. The new artificial "ionic mechanotransducer skin" has unprecedented sensitivity over a wide spectrum of pressures, which can lead to a breakthrough in the soft robotics sector, officials said. Soft robotics is a sub-field of robotics that deals with nonrigid robots constructed with soft and deformable materials like rubber and silicon. "We expect this finding to be applied to various sectors including surgical soft robotics and a health care system that desperately needs tactile interfaces between humans, robots and the environment, as well as a variety of industrial sectors such as search and rescue," said Kim.